With the continual advancements in healthcare technology and service, investing in your cardiac practice, upgrading equipment, and improving efficiency is an ongoing process. One of the most significant considerations is not only when to replace a camera, but also if refurbished, or new equipment might be a better decision. A nuclear gamma camera is a significant investment for any practice, so it’s natural to focus on the cost. There are times when prioritizing price is a smart idea, but only when the product still retains an acceptable level of value. There are many refurbished cameras that have a considerable amount of life left and could be a wise investment. When you evaluate new versus used equipment, consider how much image quality has improved in recent years, the availability of new software programs, and the viability of the camera’s current operating system. When the camera is in need of repair, will parts be readily available and will the manufacturer agree to service it? Some manufacturers include a firm end-of-service date on their equipment, which leaves you at the mercy of third-party service providers and replacement parts. Some service companies may even decline service because of age, limited part availability, and the associated risk. Older, refurbished cameras may undoubtedly be in working order, but their boards and analog methodologies could be less effective. With age, the camera’s light pipe, which includes crystals that eventually yellow and crack, will no longer respond, sometimes without warning. Replacement crystals for older cameras may not be available. Even with newer refurbished cameras, the crystals have already aged, may be hydrated, and are potentially unfixable. Be sure to inquire about and examine the crystals if you’ve considering a refurbished camera. Another important factor to consider is HIPAA compliance. Many refurbished cameras cannot be upgraded to current software versions, and, because they’re no longer supported by the manufacturer, they can’t they be patched securely. Consequently, the camera cannot be connected to a network because internet access imposes new risks. You also may not be able to add additional processing programs and, in the end, may be forced to purchase an entirely new software package, which will be costly. While many physicians may have excellent credit, they may not be willing to put their personal credit history on the line when purchasing capital equipment such as a nuclear gamma camera. Instead, they opt to leverage the business credit, and this can have a direct impact on the approval process and interest rate. If the practice does not have an extensive credit history, it’s more challenging to secure a loan, and interest rates are likely higher on pre-owned equipment. Additionally, if a financial institution feels that you may have issues with part availability on refurbished systems, they may be hesitant to approve a loan for older medical equipment. Be sure to discuss the details and get loan pre-approval before the sales process begins. 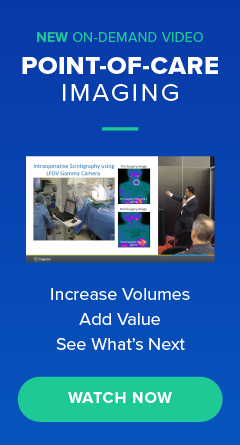 Volume is another important factor to evaluate when deciding between used or new equipment-or even whether to outsource your imaging services completely. Not all cardiac practices need a camera on site five days a week. If you’re imaging one, two, or even three days a week, you might consider partnering with a mobile imaging company. Your volume should factor into your financial investment. Without it, the lack of revenue wouldn’t warrant spending dollars on maintenance costs and might eventually lead to a decline in the integrity of the equipment. Any new or used camera that you plan to purchase should be able to expand and grow with your practice. A camera should be able to fill your current imaging needs, but also serve your practice in other ways. Would it lend itself to increased productivity, improved efficiency, and greater patient satisfaction? Sometimes it may be worth the extra investment if it allows you to move forward on another strategy that has the potential to increase revenue or to reach other goals. Lastly, knowing from whom you’re purchasing your equipment is of critical importance. An investment of this size should only be made through a reputable company with a proven track record, especially if it’s a refurbished camera. Prepare a due diligence checklist and take the time to get better acquainted with the camera, just as you would with a home, used car, or any other purchase in the second-hand market. Ask to see it, or have it inspected by an independent service company, and ask for the repair and maintenance records. It’s well within your rights to investigate the camera’s history, current value, and the likelihood of any future issues before making a final commitment. If you don’t, you’re exponentially increasing your chance of winding up with a lemon and having no recourse. Cost shouldn’t be the only consideration when buying a camera. It may be high on your list, but the value it brings to your practice should be well worth the money you spend. Digirad is proud to introduce the new Cardius X-ACT+ Imaging System. We’ve taken the X-ACT camera and completely redesigned it to offer more patient-centric features and deliver significant benefits while reducing the cost burden to the healthcare system. The X-ACT+ is the only SPECT/FAC MPI system that features a combination of solid state detectors, rapid imaging detector geometry, low dose fluorescence x-ray attenuation correction, advanced 3D-OSEM reconstruction techniques, and TruACQ Count Based Imaging™. It offers high definition, high efficiency, unparalleled clinical accuracy—all while lowering the patient’s radiation dose. In addition to the state-of-the-art technology, many of the camera’s improvements focused on patient ergonomics. For example, the system is closer to the floor, includes handrails, and the seat placement has been modernized. The system’s new design is not only more comfortable, it’s easier and safer to access for all types of patients. The X-ACT+ ultimately improved upon Digirad’s patient-friendly, open, and upright design. X-ACT+ also positions the patient perfectly for cardio-centric imaging. The heart never leaves the field of view and images are free of truncation or attenuation artifacts. The X-ACT+ produces images with superior clinical accuracy and provides a positive imaging experience overall. The X-ACT+ is unique because of its combined design, technology, and superior imaging quality. If you’re ready to upgrade your imaging services, the X-ACT+ is the only improvement you’ll need to make. Should I buy a nuclear camera or use a mobile service? Study volume is an important metric when considering purchasing a nuclear camera vs. contracting with a mobile provider. On the low end, 60 studies per month could technically support camera ownership, but a monthly average of 120 is a more sustainable number. Below 100 studies per month becomes financially challenging and requires temporary staffing and other hybrid approaches to make the best of things. Another way to evaluate the volume question is on the number of days in the week in which you scan. Practices that prefer imaging less studies per day and more days per week will find a need for creativity in managing their non-equipment costs in order to achieve reasonable profitability from their Nuclear Lab. Often, your prior experience can be a contributing factor in the decision. If you’ve owned a camera in the past and understand the requirements, it’s easier to know if ownership is a right fit. If you are starting up a practice, you could initially opt for a mobile service to get a better feel for your study volume before making a major purchasing decision. Given all of the various start-up expenses, including needing cash in the bank to fund the lag between your open day and cash flow back from the various payors, whether or not you want to tie up cash or credit resources for a major purchase is a critical decision point. Physicians who open a smaller 1 to 4 provider practice, versus a multi-physician practice, often choose mobile services over ownership for the similar reasons. One major factor that complicates the decision is clarity on the actual cost burden or potential profitability when purchasing a camera. Because mobile services typically use per-day or other similar billing options, your financial risk is very low, and the practice has a very clear understanding of profit overall, and per day of service. Since camera costs (lease payment or depreciation plus repair and maintenance) are not the highest cost drivers, thinking that ownership is more profitable than a service is not a given. With pending insurance reimbursement changes, new payment models on the horizon, and the reality of appropriate use criteria, it’s difficult to know the exact financial return you can achieve from a camera purchase. The question of how to provide imaging services touches on a full spectrum of factors including revenue, profitability, patient convenience, market perception, practice size, and patient satisfaction. The final decision is shaped by your study volume and how established your patient base is, but ultimately it comes down to how comfortable you are with the requirements of running a nuclear lab and your willingness to invest the time and energy into managing on your own. Digirad has expanded its offerings as a nuclear medicine company by adding a variable angle camera to its growing array of high-quality imaging equipment. Through their relationship with Universal Medical Resources, Inc., the exclusive North America distributor for DDD Diagnostic, Digirad has added the CorCam™ and QuantumCam™ cameras to its product catalog. QuantumCam is a dual detector, variable angle, total body, SPECT and general purpose nuclear imaging system. It offers a large field-of-view and delivers all the flexibility you would expect from a variable angle camera. QuantumCam has the ability to perform total body scans, bone SPECTs, planar imaging, and cardiac imaging in the 90-degree mode. With its highly flexible detector positioning, and open gantry, non-claustrophobic design, it allows for ease-of-use and greater patient comfort. Compared to other SPECT cameras on the market, the QuantumCam has lower acquisition and ownership costs, a smaller footprint and higher imaging quality. “It’s hard to find all these attributes in one device,” says Jason Kitchell, Chief Operating Officer at Universal. DDD is a highly reputable company with extensive experience developing and manufacturing gamma cameras and gamma products. They have been a long-term provider in the nuclear medicine industry and are a major supplier for GE, Phillips, and Siemens. You’ll surely recognize their products, even if you don’t recognize their name. Digirad is in the business of providing the best, most cost-effective solution that meets a customer’s specific needs. By expanding their product options to include a variable angle camera, Digirad offers a more comprehensive selection and, thereby, better serves their customers. Digirad is looking forward to growing their relationship with Universal and bringing the benefits of the QuantumCam to the market. Both the Cardius 2XPO and Cardius 3XPO cameras provide patients with an open design and a compact frame that is easy for technologists to operate. These cameras are ideal for cardiology offices because the solid-state flat-panel detector technology and geometry allow for high image quality with optimal throughput. 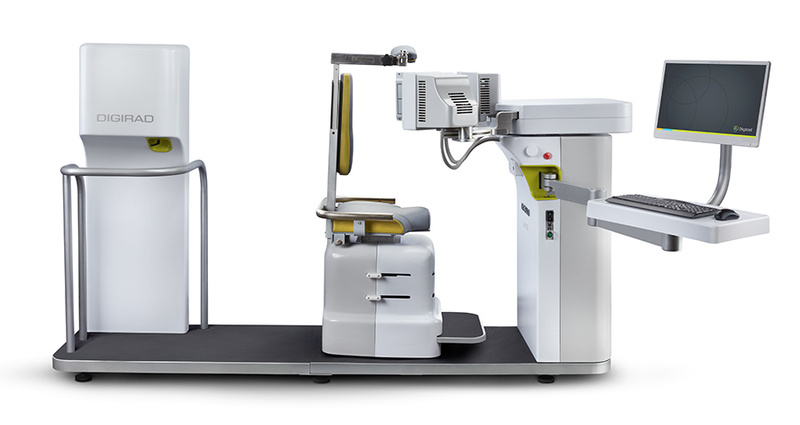 Both of these systems are small enough to fit in a standard exam room, and the Cardius 2XPO is available in either fixed or mobile configurations. The X-ACT and Ergo cameras are ideal for any hospital setting. The X-ACT camera fits in an 8×9 room, and it does not require shielding or special room requirements. With its triple-head capabilities, the X-ACT is patient-centric, reducing the radiation dosage to the patient by up to three times that of other conventional nuclear cameras. The X-ACT camera also provides physicians with attenuation correction to improve diagnostic imaging confidence. The Ergo is a flexible, multi-purpose nuclear imaging camera. Because of its size and portability, the Ergo can be brought to the patient’s room and to various departments including the ICU, pediatrics, women’s health, or surgery. This eliminates the need for transporting a patient and reduces the need for additional hospital staff. Contact our team if you have any specific questions about the size or use of a Digirad Solid-State nuclear camera in your facility.